Obituary for Betty Jo (Pfaff) Osmus | Lanman Funeral Home, Inc.
Betty Jo (Pfaff) Osmus, 91, of Okeene passed from this life peacefully on Thursday, March 22, 2018. She was born on February 3, 1927 to Edward and Elizabeth Pfaff in Okeene, OK. She was united in marriage to Willie J. Osmus in 1947. To this union came ten very lucky children, five boys and five girls. 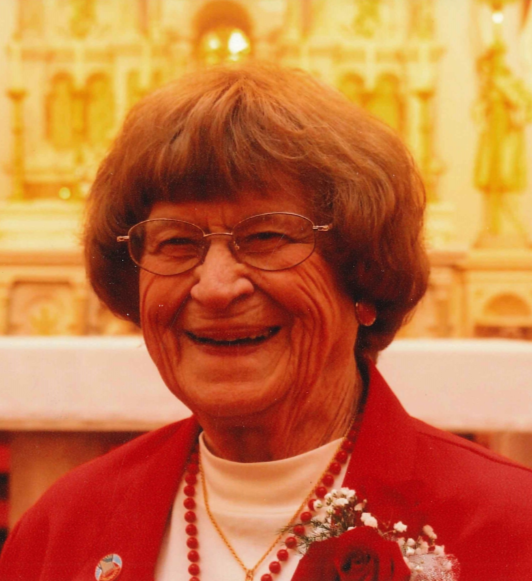 She graduated at age 16 from St. Mary’s Catholic School in 1943. She proved her perseverance and work ethic by graduating two years ahead of the rest of her class. Betty attended Oklahoma A&M for one semester before she had to quit to take care of her sick grandmother. Betty helped her father on the farm as a teenager. At age 16, she was asked by Msgr. Van Dorpe to play the organ for a funeral mass and she continued to play the organ for the next 74 years. She played for ten different priests. They all learned quickly that she was in charge of the music. She told the priests that she would take care of the music and they could take care of the Mass. She worked for her father at the Pfaff Insurance Agency until his death in 1978 and then she became the owner. She ran the agency for 14 years, then sold it and retired to the farm and her hobbies. Betty’s hobbies included: gardening, canning, working crossword puzzles, oil painting, making jeweled crosses and frames, cooking, baking, sewing and watching Thunder games and game shows. She loved sharing the fruits of her labors with her family and friends. She enjoyed volunteering for her church and community. Some of her favorites were prison ministry, blood drive, playing the piano at the nursing home, working at the thrift shop, Okeene Alumni and the Dwight Boeckman Golf Tournament. She is survived by five sons and three daughters: Bill and Joyce Osmus of Fairview, Jim and Janet Osmus of Okeene, John and Debbie Osmus of Hennessey, Ed and Kaye Osmus of Velma, Mary Jo and Wayne Cayot of Okeene, Sherry and Jack Damron of Sayre, Joe and Maria Osmus of Okeene and Carla Sue Osmus of Oklahoma City. She is also survived by 23 grandchildren, 46 great-grandchildren, 3 great-great grandchildren and 1 on the way. She is preceded in death by her husband; daughters, Donna Nusz and Diana Osmus; son-in-law, Lonnie Nusz; grandson, Jeff Osmus; great-granddaughter, Tara Osmus; brother, Orville Pfaff; sister, Edwardene Garrison and both her parents. Funeral service will be held Monday, March 26, 2018 at St. Anthony’s Catholic Church in Okeene at 3:00 p.m. with burial at Calvary Cemetery. Rosary will be Sunday, March 25, 2018 at 6:00 p.m. at St. Anthony’s. Arrangements are by Lanman Funeral Home, Inc. of Okeene. Viewing will be Sunday at the funeral home 1:00 p.m. until 5:00 p.m. Viewing will also be on Monday at the church 10:00 a.m. until 2:45 p.m. www.lanmanmemorials.com Facebook: Lanman Funeral Home Inc.
Memorial contributions to St. Anthony’s Parish Hall Fund or St. Jude’s Hospital may be sent to Lanman Funeral Home, PO Box 372, Okeene, OK 73763.